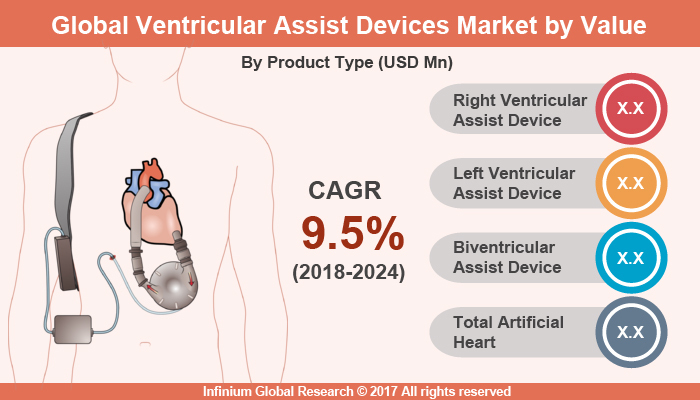 A recent report published by Infinium Global Research on ventricular assist devices market provides in depth analysis of segments and sub-segments in global as well as regional ventricular assist devices market. The study also highlights the impact of drivers, restraints and macro indicators on the global and regional ventricular assist devices market over the short term as well as long term. The report is a comprehensive presentation of trends, forecast and dollar values of global ventricular assist devices market. According to report the global ventricular assist devices market is projected to grow at a CAGR of 9.5% over the forecast period of 2018-2024. An electromechanical device used for assisting cardiac circulation, which is used to partially or completely replace the function of a failing heart is known as a ventricular assist device. The VADs are used for short-term, for patients recovering from heart attack and for patients recovering from cardiac surgery; the patient suffering from advanced congestive heart failure use long-term VADs. VADs are different from artificial hearts, which are designed to undertake cardiac function, and generally, need the removal of the patient's heart. Moreover, VADs are designed to support either the right ventricle (RVAD) or the left ventricle (LVAD) or to assist both ventricles (BiVAD). The left-ventricle assistance device (LVAD) is the common device applied to a defective heart, but when the pulmonary arterial-resistance is high, then a right-ventricle assistance device (RVAD) might be necessary to resolve the problem of cardiac circulation. If both an LVAD and an RVAD is needed a BiVAD is normally used. Growth in the incidence of patients with heart failure and lack of heart donors is likely to boost the growth of the market. In addition, raising the incidence of cardiovascular diseases such as coronary artery disease, hypertension, and heart failure. Moreover, growing the occurrence of diabetes, genetic factors, lifestyle factors such as tobacco consumption, junk food, alcohol addiction, substance abuse, are likely to contribute to cardiovascular disease population. On the other hand, high cost associated with devices and its implementation and high risks involved with a VAD implantation procedure is likely to hamper the growth of the market. Furthermore, research and development carried on the innovation of the novel device are likely to bring more opportunities to the market. For instance, in 2017, Heartmate III has been approved by the FDA. It is smaller than its predecessor HeartMate II and uses a full maglev impeller instead of the cup-and-ball bearing system found in HeartMate II. Among the regions, North America is expected to be the largest market for VAD. Rising occurrence of cardiovascular diseases developed healthcare infrastructure, high patient awareness levels and better compensation policies for implantation procedures is the key factors drive the growth in this region. According to CDC, about 5.7 million adults in the U.S. have heart failure. The constant improvement in healthcare infrastructure in emerging countries such as India is likely to drive the growth of the Asia-Pacific region. The merger and acquisition and business expansion are the key strategies of the leading player in this market. For instance, Abbott signs definitive agreement to acquire St. Jude Medical to create a premier medical device leader with top positions in high-growth cardiovascular markets, including atrial fibrillation, structural heart, and heart failure, in 2016. Medtronic acquires HeartWare International to expand heart failure portfolio in 2016. The report on global ventricular assist devices market covers segments such as product type. On the basis of product type the global ventricular assist devices market is categorized into right ventricular assist device (rVAD), left ventricular assist device (lVAD), biventricular assist device (bi-VAD) and total artificial heart (TAH). The report provides regional analysis covering geographies such as North America, Europe, Asia-Pacific, and Rest of the World. In this section, the key trends and market size for each geography are provided over the period of 2016-2024. The countries covered in the North America region include the U.S., Canada, and Mexico; while Asia-Pacific includes China, Japan, India, South Korea, Malaysia, and among others. Moreover, Germany, U.K., France, Spain, and Rest of Europe are included in the European region. The U.S. drives the growth in the North America region as it is the largest market in the region. The Asia-pacific region offers a substantial potential for the market growth owing to rapid growth in markets such as India and China. The APAC region is projected to experience a growth at a CAGR of x.x% over the period of 2018-2024. The report provides profiles of the companies in the global ventricular assist devices market such as, Berlin Heart GmbH, Sunshine Heart Inc., SynCardia Systems LLC, St. Jude Medical, Heart Ware International, Abiomed, Thoratec, Jarvik Heart, Cardiac Assist and Others. The report provides deep insights into demand forecasts, market trends, and micro and macro indicators. In addition, this report provides insights on the factors that are driving and restraining the global ventricular assist devices market. Moreover, IGR-Growth Matrix analysis given in the report brings an insight into the investment areas that existing or new market players can consider. The report provides insights into the market using analytical tools such as Porter's five forces analysis and DRO analysis of ventricular assist devices market. Moreover, the study highlights current market trends and provides forecast from 2018-2024. We also have highlighted future trends in the ventricular assist devices market that will impact the demand during the forecast period. Moreover, the competitive analysis given in each regional market brings an insight into the market share of the leading players. This report will help manufacturers, suppliers and distributors of the ventricular assist devices market to understand the present and future trends in this market and formulate their strategies accordingly.